Hey guess what, there’s a new Star Wars movie coming out! 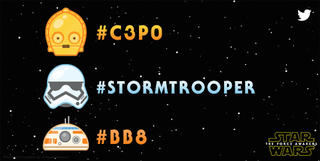 And as the latest ploy to dominate the online conversation, the film has partnered with Twitter to create emoji-generating hashtags for three members of the Episode VII universe, just as a new teaser trailer hits at Star Wars Celebration. The emoji themselves are super adorable and super easy to use. Using the hashtags on Twitter is the only way to make the emoji appear, which means you have to go to Twitter dot com or use the Twitter app in iOS 8.3 to see them—you can’t cut and paste them to use them elsewhere. My only question: WHY NO #R2D2??? Anyway, even though I’m a Star Wars person, I prefer the Vulcan salute emoji which is not really an official Twitter marketing partnership, it’s just a new Unicode symbol that didn’t make it into the Apple keyboard. But iOS 8.3 now supports it (so you can only see it on a phone). And I’d argue that it’s infinitely more utilitarian in everyday communications. Of course, by the time the next Star Trek movie comes out, I’m sure Twitter will have taken this hashtag over, too.